-This OEM design engine cover deck lid panel with vent rear deck suit the McLaren MP4-12C and the 650s, it is produced in CFRP structure that gives to the part a superior stiffness, aerospace strength & durability. -This engine bonnet with vent rear deck set is a direct replacement part, fitted in the same manner as the OEM components without modification. No core or exchange is required, allowing you to retain your original components as part of the investment. 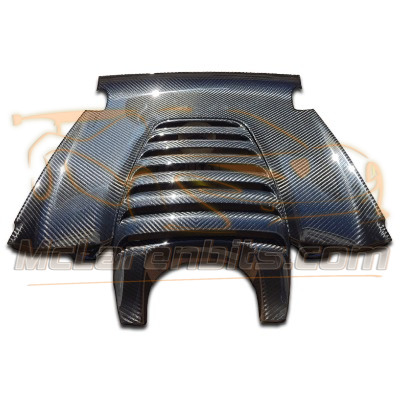 -We manufacture our part in the matching factory pattern, but our Customization service provides a wide range of distinctive carbon fibre pattern and colour combination available under customer request. We provide a selection of premium quality carbon fibre aerodynamics and body components; carbon fibre laminated interior parts, aluminium and magnesium custom design forged wheels, Stainless steel or Titanium Valvetronic exhaust system and power pack. Let's Us be a major factor in your next bespoke project. Hi David, I have good fun with my MP4-12C, lowering H&R springs, Forgiatos wheels, Michelin Pilots, and of course your impressive carbon fibre pieces. Welcome to Mclarenbits which specialises in the Mclaren sports car aerodynamic components and accessory. You could tell us what you have in mind; we will make all effort to fill full your dream. Our carbon fibre collection will match your expectations. In fact, we will make your car the representation of your personality, your self-expression. Efficient designs, lightweight and high mechanical properties are our bases. You can send us a message to place an order; you can pay with TT transfer, PayPal and credit card. We ship worldwide by Dhl, FedEx, UPs, etc. We Sale our product online, we do not have a physical shop for now, but we are a real company that focuses on honesty and sincerity, we are doing business in the way to grant a premium status from our customers, no joke here. We are online contact us any day, any time.